No Way....Like most mothers...we often look at our own childhoods and always want a little better for our own family...for me it's always been about good bonds and communication..I love you... is a word used on a regular basis in my house amongst us all. 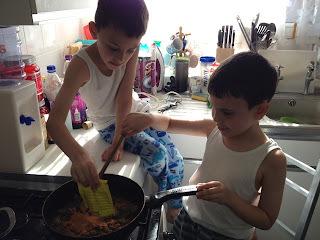 3 - Share responsibilities of the home - Encourage your children understand the importance to helping and contributing to the home - OK... I don't mean big daily cores but responsibility for there actions...making bed...tidying room and generally helping out. 4 - Enjoy each others company - ignore the negative things and praise the positive- that's for all....husband/wife including. 5 -Meal Times -as often as possible have a family meal together. 6 - Family time - watch a movie... go out together..link in and share an activity together and give opportunities for you children to choose activity. 7 - Couple nights... its important to keep you relationship with your spouse alive...one to one time together to build bonds..share experiences and come together.Even if its a cosy night on the sofa together watching a film. 8 - Never argue with your spouse in front of the kids...if your children do see you bickering... its important that you explain to your children that you were having a disagreement and everything is sorted - children thrive on stability so keep differences at bay..... there's always a time and a place. 9 - Encourage siblings to share and respect each other it's important to maintain positive bonds. 10 - Compromise - family life changes all the time...its important to be flexible to meet each others changing needs.